Great pedals, I use them on my road and gravel bikes. Does what it says on the tin. I have these on numerous bikes. Not the lightest in the world, but good balance between weight and cost if you'd ask me. I have pair of these on my CX bike, which has endured a lot over the last season! Always go back to these pedals. Allows you to wear walkable shoes! I have always used Shimano M540 SPD pedals on all my bikes. I love them. As usual, the best SPD pedal for the money, hands down. Sure it's heavier than an XT set or the feather weight XTR`s but not by much - blindfolded you will be pushed to feel the difference. Excellent pedals, if you are new to the clipless world or want a reliable bulletproof pedal, look no further! Bought these pedals on sale - excellent bargain. Have previously used the shimano M520, but these have the slimmer looking axle, which looks good. Not much difference in weight. Have used other brand MTB pedals, but prefer the much better ease of release with the shimano (especially as I commute thru London - don't want a problem dis-engaging amongst the traffic!) Merlin service was excellent, delivered the next day!! As usual there was still speedy and good service from Merlin. The pedals are for my CX commuter bike to replace the stock toe strap pedals. They have a very positive connection and good amount of float, not too much and not as tight as my SPD SL pedals. These pedals came with the SMPD-22 pedal adapters which I was not expecting (another bonus point for Merlin!) which makes them a perfect all round commuter/family bike ride/pub trip pedal. Would recommend these pedals. Early days for these pedals, but they have withstood a solid strike to a tree stump without being compromised. So far so good. Excellent pedals. Much like XTR were only a wee while ago. Decent price and good quality. Really great value. Used these pedals before, long lasting,	comfortable. Pedals have a similar construction to XT and XTR pedals and work just the same. I use these pedals for all types of cycling except road racing. They last for years an can easily be repacked with grease. These pedals are good for my bike, a little smaller than I thought they would be but they work perfectly. Also gets the job done. I have the Schwinnic2 spin bike. Recommended to me and I am impressed so far, I have not yet adjusted tension as it seems fine as supplied. I think these are worth the little extra over the M520 - especially at a very good price from Merlin. Have already got M520 pedals on another bike so thought I'd try these. The M540s are a nice pedal but don't feel much different to the M520. They are lighter but only marginally so. If you can get them at a discount then they are worth getting otherwise the M520 is just fine. Be advised that the M540 needs an 8mm Hex key to attach them and the M520 needs a 6mm Hex or a 15mm spanner. Excellent pedals, extremely good value for money, similar design to XT and XTR pedals which I have used on other bikes and look a little more upmarket than the very basic M520	(which still work well). With this type of pedal it is important to correctly position the cleat in the shoe, for many rider's feet a little outward rotation is required. Measured weight came out lighter than published figures. High value for the money especially when I can buy here at Merlin's for a comparable price to the M520's!!. I love the idea of hex key tightening, more practical without the need for a bulky 15 mm key. I don't have any comments on durability yet but they definitely look sturdy. I've been using one set for going on two years and just bought another so I don't have to move them from bike to bike. They don't wear out as fast as Crank Brothers, and seem less prone to impact-related breaks. However even as a seasoned user of clipless pedals, I find the included "standard" cleats don't allow release at all from certain angles which led to a few near misses for my knees not to mention other body parts during crashes. As it turns out the multi-release SPD cleats solved this - though now they are prone to sometimes releasing accidentally during pedal strikes, it's not a big problem (still better than Crank Bros) and well worth it in order to not have my leg twisted awkwardly under my bike in a crash. Wonderful middle of the road pedals. Slightly lighter than M520s, which I have been used to. Works just as well. Bought these for my cyclo-cross bike, decided it deserved better than the M520's but no point spending anymore when these work so well. Feel rock solid and I'm sure as per other SPDs I've had, will last and last. Great price and service from Merlin as usual. These double sided pedals work well on my road bike, easy to get clicked in. Usual high quality from Shimano. Even got a bonus pair of SM-PD22 reflectors so you can convert one side for regular shoes. Great product at excellent price. I have a couple of pairs of M520 spd pedals and the 540's are lighter and more robust in my opinion. After my M520 pedals started clicking I replaced with these M540 pedals. Low cost, excellent for commuting and touring needs. Would strongly recommend. Great price, and were supplied with pedal reflector adapters for the UK market. Great pedals. Solid engagement. Plus, they last longer than any other mtb pedal I or friends have used. Great pedals, great price. Ultra reliable & easy to maintain. And of course great service from Merlin. Very well made, feels a lot more expensive than they were! Awesome pedals! Lightweight and super easy to clip in and out of. I started with flat pedals and just recently tried clipless using entry level Exustar pedals. These M540's deliver the best value in performance, weight and looks. Legendary Shimano quality at the lowest price anywhere courtesy of Merlin. Can't be beat! If Jonathan Page can win a CX Nats with these pedals, I can finish Top 20 in the Bs at BASP with them. Excellent value. My second pair of these for a new bike. Bit lighter than the M520s and great value from Merlin with super quick delivery. Been using the M520's for 2 years now with no problems. When it was time to replace the cleats in my shoes I decided to replace the pedals too. Chose the M540's as they are (from the spec listed) the same weight as the XT versions. In use they work perfectly, haven`t noticed the weight difference but every gram helps! Usual Shimano bulid quaility, so expect them to last. Have several sets of these, last ages. Reasonable weight for an inexpensive price. Great service from Merlin, as always. Great quality pedal, easy to fit and adjust. Bought as an upgrade from my original shimano pedals that have done 7500km. 30 grams lighter and much nicer to use. My first pedals clipless pedals so nothing to compare them to. I use them with my road bike. They were easy to fit. Use, I have them on the easiest clip-in/out setting, and they are so easy to clip in and out of it's ridiculous. You dont have to "try" and clip into them, you can start pedalling (away from lights) quite happily, with reasonable power without being clipped in! My shoes just find their way into pedals without me trying within seconds... Clipping out is so ridiculously easy, - like I say, my first time using clipless pedals, i've not fallen off yet! (touch wood). Would highly recommend. I use them with Shimano M088 shoes which are also perfect for me - look good and are very comfortable. I bought these for my road bike as I own the XTR's on my stumpy and to be honest these are just as good! Good pedals, I've had a set on my mountain bike for the last couple of years. Have survived much mud and jetwashing with no issues. Now got some more for my road bike. Great pedals. Lighter and better made than the M520s for not a lot more. They clip in and out much more smoothly and, even on lower tension, you are unlikely to unclip by accident. Important, you need an H8 allen key or crank wrench to fit these pedals - a normal pedal crank won't fit and tightening by hand isn't enough. These pedals are excellent look great feel great easy to maintain, quite light for spd pedals. I use them for cross country, would buy them again if i get another bike. 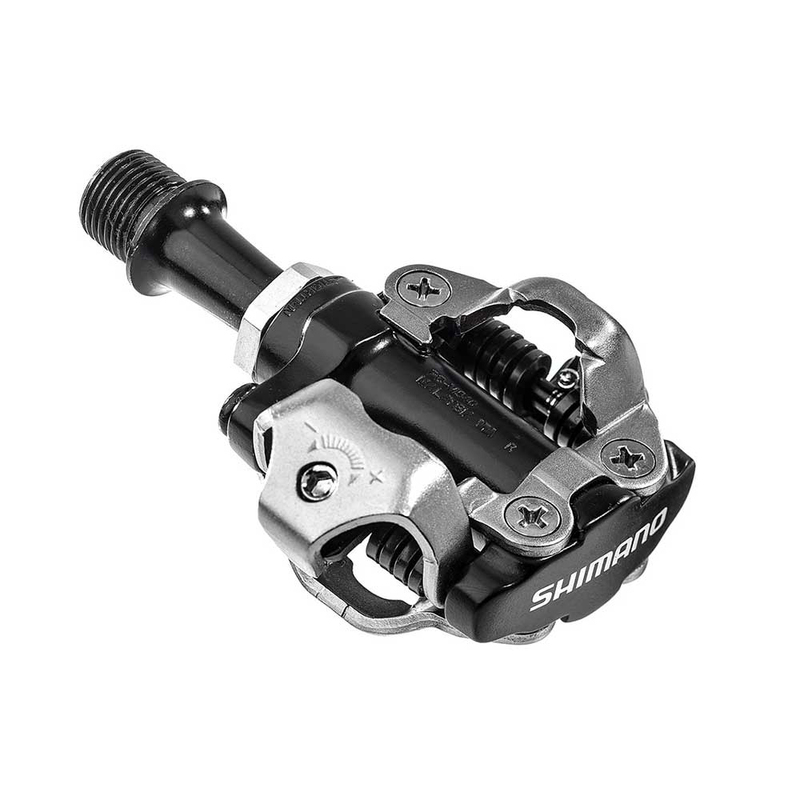 Like all Shimano products these pedals are 100% reliable. Had several pairs over the years and have never had a problem. Merlin service as usual was spot on. Need shiny lumps for putting under your feet? These are lighter than M520's and not too much dearer. Great price, great pedal. Does everything, used for MTBing, road biking and commuting. Very nice pedals. Easy to clip in and out. Has transformed my bike! A fast transaction and delivery to Australia (9 days). It's a shimano pedal so its reliable. They are surprisingly easy to click into having only ever used road pedals/cleats previously. They came with a plastic cover (with reflectors) to enable riding with casual shoes. It took a long skinny screwdriver to get the leverage to release these from the pedal. Fortunately releasing your cleats from the pedal is not that hard. Speedy delivery - packed & sent on day of order..! Have only used pedals a couple of times but so far seem really good quality & really easy to adjust etc. Would recommend product and Merlin - will use Merlin again..! Fantastic. Purchased these to replace my the same model. I have never cleaned them or lubricated them so the bearings have failed. My fault. These are cheap enough to be disposable! Works perfect, have them on both my bikes now. Seem bombproof. Great value entry level pedal. The construction and quality are very good for a product of this price, they operate smoothy and lock in the shoes with a very positive 'click'. These pedals are also quite easily serviced using normal tools. Great pedals for the price and with cleats. Put this pair on my Cross bike for the winter, as got a pair on my mountain bike which I have been using for over 12 month's in all weather with no problems. Great fast delivery from Merlin. This is the pedal you are looking for. Its way cheaper than the xt pedal and only a tiny bit more than the M520. Why not just get the M520? This pedal is lighter, has a stronger axle and has sealed cartridge bearings on the axle and spindle, the M520 only has sealed on the axle. Had mine for more than 6 months now, they are so smooth and easy to adjust. Great pedals, these are my 6th set of M540 after I started using them more than 5 years ago. The first set still in a good working order and now used on my commuting bike on a daily basis. These pedals are very light for the amount of money you pay especially when you order from Merlin. Excellent pedal, look good, easy to adjust and are quite light. Bought these for my second bike. They work just as well as more expensive models and are only a few grams heavier. Look good too. Mainly for off road use I have owned a pair of these for over a year and highly recommend them, easy to install, adjust and use. The versatility of this product has enabled me to use the recently purchased pair for my touring bike - Also,I do like the clip on reflectors supplied! Excellent pedals. Light and durabel. Great design. Gives your feet more support than most spd's and easy to clip in/out. Great value for money. Great product which arrived extreamly quickly. Great service from Merlin Cycles. Excellent Pedals, XT quality for half the price. Brilliant pedals neat looking easy allen key fitting. I now have two bikes with these pedals both bought from merlin at a competitive price and excellent service. I purchased Shimano M540 pedals for use on my road bike after using these pedals for years on my mountain bike. They are lightweight and bulletproof. I have bashed so many rocks with these pedals it is miraculous that they have survived. (Perhaps I should learn to ride better?) I switched to the M540 pedals for road biking because they offer more horizontal rotation for the foot than the Shimano road pedals I previously used. As a bonus I can use the same comfortable Specialized mtb shoes for either sport. I recommend these pedals if you like clipless riding for either road or off-road. Merlin Cycles offers these pedals at the best price in the world. Superb product, superb price and very quick delivery. I would strongly recommend purchasing these pedals from this site. My first SPD pedals and a great buy. I was nervous about buying clip-in pedals. Having read reviews about entry-level pedals I also read about how the bearings in these were a bit better protected from the elements. Simple to fit, quite easy to get used to (practised just clipping in and out in my landing) and transformational effect on my riding. Definitely easier than the toe-clips and with better power transfer. I'd buy them again for my next bike. Super quick service from Merlin too!